April 1981 (photo by Tom Robe). In the winter of 2002, about a year before I sold the store, I talked to some of the people who had worked at Bakka who had become published authors, and requested a short story from each one. 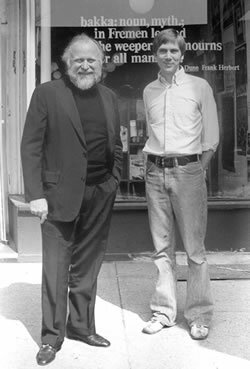 We would collect the stories, and publish them to commemorate the store's thirtieth anniversary. The authors were: Cory Doctorow, Ed Greenwood, Nalo Hopkinson, Tanya Huff, Fiona Patton, Robert J Sawyer, Chris Szego, Tara Tallan and Michelle Sagara West. All had worked in some capacity in the store, from Ed's three-day babysitting job to Michelle's ongoing (sixteen years plus) entrapment. 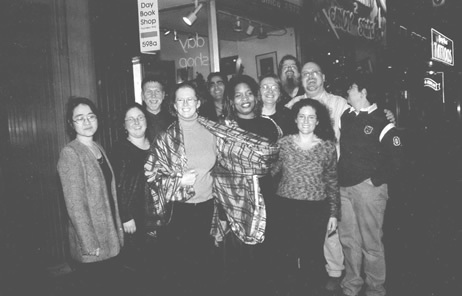 These people were only a sampling of the store's staff over the years, but their position in the writing community guaranteed the ANTHOLOGY's success. The BAKKA ANTHOLOGY project was the most fun I have had in all my time as a bookseller. It involved every aspect of book creation, design and production, and I learned more from that single project than from my many years behind the counter. From initial concept to picking up the bound copies from the printer, I got to see each step of the process as it was made. The book was produced at Coach House Press, as venerable a publishing house as Canada can offer. Each copy had a signature page bound in; I had driven around southern Ontario in November to take the pages to the authors to sign. We produced 3000 copies, and sold just over half. The remaining copies were given to contributors and reviewers, and the ANTHOLOGY quickly became a collector's item. Each of the contributors generously donated their work to the store. Ex-staffer Kristen Chew edited the collection, Space TV's Mark Askwith wrote a foreword, and award-winning author Spider Robinson contributed the introduction. Ted Snell acted as the technical designer and Sal Nensi was the producer and promoter. The photo at left was taken in the spring of 1981. Frank Herbert had just published GOD EMPEROR OF DUNE, and was on tour to promote it. I had just bought BAKKA (named for a reference in Herbert's classic novel, DUNE), six months previous. The event was one of the most successful for the store, and marked the start of a long and close association with writers and publishers that characterized the store. Tom Robe took the photo in front of the Queen Street store, and we used this photo as the frontespiece for the BAKKA ANTHOLOGY. The front cover and the signature page from the BAKKA ANTHOLOGY.